Hydrothermal Vents The first hydrothermal vent community discovered was found along the Galápagos rift zone. A rift zone forms where two plates of Earth's crust are spreading apart. In your Science Journal, describe the energy source that heats the water in the hydrothermal vents of the Galápagos rift zone. 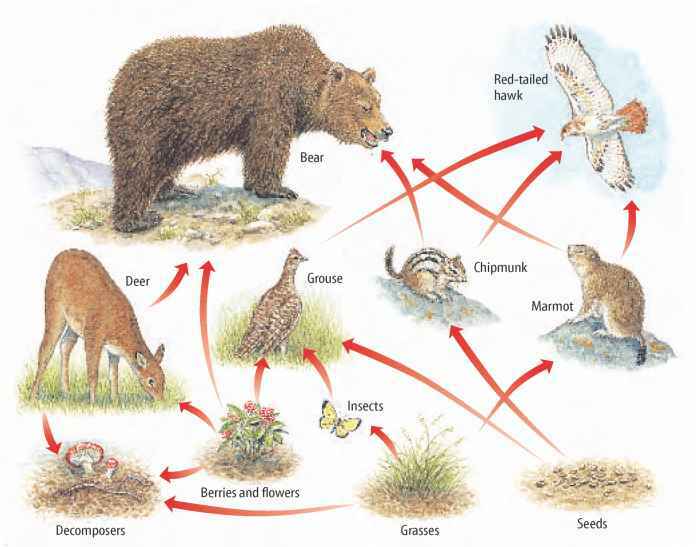 Figure 15 In this food chain, grasses are producers, marmots are herbivores that eat the grasses, and grizzly bears are consumers that eat marmots. The arrows show the direction in which matter and energy flow. Infer what might happen if grizzly bears disappeared from this ecosystem. 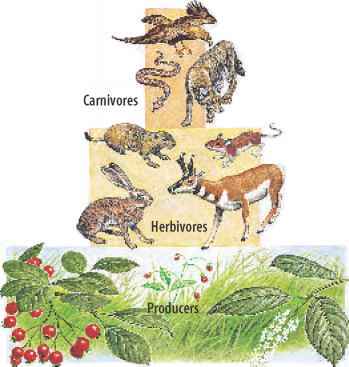 Figure 16 Compared to a food chain, a food web provides a more complete model of the feeding relationships in a community. Food Webs A forest community includes many feeding relationships. These relationships can be too complex to show with a food chain. For example, grizzly bears eat many different organisms, including berries, insects, chipmunks, and fish. Berries are eaten by bears, birds, insects, and other animals. A bear carcass might be eaten by wolves, birds, or insects. A food web is a model that shows all the possible feeding relationships among the organisms in a community. A food web is made up of many different food chains, as shown in Figure 16. Food chains usually have at least three links, but rarely more than five. This limit exists because the amount of available energy is reduced as you move from one level to the next in a food chain. Imagine a grass plant that absorbs energy from the Sun. The plant uses some of this energy to grow and produce seeds. Some of the energy is stored in the seeds. Available Energy When a mouse eats grass seeds, energy stored in the seeds is transferred to the mouse. However, most of the energy the plant absorbed from the Sun was used for the plant's growth. The mouse uses energy from the seed for its own life processes, including respiration, digestion, and growth. Some of this energy was given off as heat. A hawk that eats the mouse obtains even less energy. The amount of available energy is reduced from one feeding level of a food chain to another. An energy pyramid, like the one in Figure 17, shows the amount of energy available at each feeding level in an ecosystem. The bottom of the pyramid, which represents all of the producers, is the first feeding level. It is the largest level because it contains the most energy and the largest number of organisms. As you move up the pyramid, the transfer of energy is less efficient and each level becomes smaller. Only about ten percent of the energy available at each feeding level of an energy pyramid is transferred to the next higher level. r^L— j—- j Why does the first feeding level of an energy \JLMiisiiiilii3SliaiiM pyramid contain the most energy? Figure 17 An energy pyramid shows that each feeding level has less energy than the one below it. Describe what would happen if the hawks and snakes outnumbered the rabbits and mice in this ecosystem. 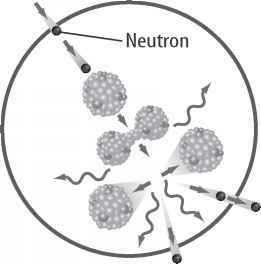 • Most producers convert light energy into chemical energy. • Some producers can produce their own food using energy in chemicals such as sulfur. • Producers convert energy into forms that other organisms can use. • Food chains show how matter and energy pass from one organism to another. • Energy pyramids show the amount of energy available at each feeding level. • The amount of available energy decreases from the base to the top of the energy pyramid. 1. Compare and contrast a food web and an energy pyramid. 2. Explain why there is a limit to the number of links in a food chain. 3. Think Critically Use your knowledge of food chains and the energy pyramid to explain why the number of mice in a grassland ecosystem is greater than the number of hawks. 4. Solve One-Step Equations A forest has 24,055,000 kilocalories (kcals) of producers, 2,515,000 kcals of herbivores, and 235,000 kcals of carnivores. How much energy is lost between producers and herbivores? Between herbivores and carnivores? Which organism has the least amount of energy in a food web? What animal eats the grass food chain? What does the rainforest and river animals for food chain? What rain forest animale eats a chipmunk? What does a energy pyramid show? What the food chain for grizzly bears? What is the energy source that heats the water in the hydrothermal vents of galapagos rift zone? What food chain does the forest have with the animals names? What animal eats grass in the rainforest? What eats a grass seed in a food web? Where is the grizzly bear on the food chain? What eats a mouse food chain? What animal in the rainforest eats grass food web?